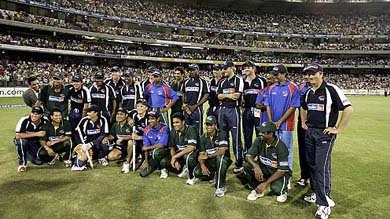 The runs did not matter nor the wickets as it was the spirit that triumphed when the world’s top cricketers played in a unique charity match before a capacity crowd of 70,101, raising over $ 14.5 million (Aus) for the tsunami victims. Though Mr Jagmohan Dalmiya has to abdicate his position as the "Patron-in-Chief", the former president of the Board of Control for Cricket in India felt vindicated at the Supreme Court ruling, upholding the BCCI elections held on September 29, 2004 in Kolkata, which proved that the "judiciary was vibrant". Little-known spinner Enamul Haque grabbed six wickets as Bangladesh won their maiden Test here today, thrashing Zimbabwe by 226 runs on the fifth and final day of the first Test. 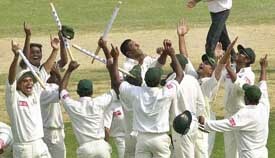 Bangladesh players celebrate after beating Zimbabwe in Chittagong on Monday to record their first win in Test cricket. Celebrations broke out across Bangladesh today as the cricket-mad nation beat Zimbabwe to record its maiden Test victory. Offices and shops erupted in cheers as crowds gathered around television sets to witness the historic moment. Following their seven-wicket win over Services in their first one-day Ranji trophy match at Nadaun on Sunday, the hosts Himachal Pradesh will face Haryana in their second match at the same venue tomorrow. The Haryana State Industrial Development Corporation is emerging as a major promoter of volleyball in India. Within a span of three years, HSIDC spikers have won a number of laurels at the state, national and international levels. 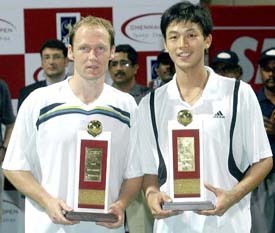 Indian doubles star, Mahesh Bhupathi proved that he is yet to settle down with a partner just like Leander Paes as he frittered away chances with Jonas Bjorkman (Swedan) to bow down to unseeded Rainer Schuettler (Germany) and Yen Hsun Lu (Taipei) 5-7, 6-4, 6-7 in a marathon doubles final, which lasted about three hours, in the ATP Tour Chennai Open here late last night. Winning titles is becoming a habit with Irina Brar. She added another feather in her cap last week by clinching the Southern India Open Ladies Golf Championship in Bangalore. Her aggregate over four rounds was 292 (75-71-75-71). She set a course record of 71 in the second round and did it again in the fourth. This is the fourth title that Irina has bagged in the past year or so. Former international Rajneesh Mishra would lead the Lucknow Nawabs in the Premier Hockey League Tier 2 competition to be held in Hyderabad from January 14-30. 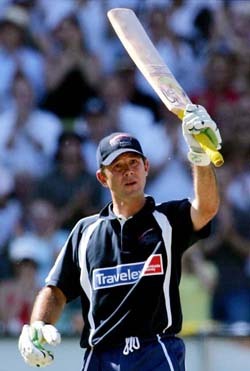 For the record, the Rest of the World, led by Aussie skipper Ricky Ponting, who scored a superb 102-ball 115, won the match by 112 runs despite a valiant unbeaten 75 by Indian vice-captain Rahul Dravid. The star-studded World XI put together a mammoth 344 for eight in the allotted 50 overs before bowling out the Asians for 232 with 10 overs to spare in the day-night outing at the Melbourne Cricket Ground. Played in a spirit of festivity despite the match being accorded official status by the International Cricket Council, the one-dayer would not be remembered only for the aggressive batting display by the Rest team or the spin magic of Daniel Vettori, Shane Warne and Muttiah Muralitharan. Sachin Tendulkar carrying drinks, Steve Waugh coming out to field and world’s top two wickettakers — Warne and Muralitharan — embracing each other would linger in memory for long. High stakes were involved in the match as every run amounted to $ 1000 and every six a whopping $ 50,000. 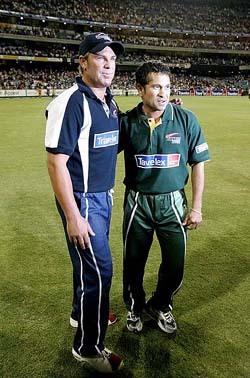 It meant Rest, whose batsmen slammed six sixes, raised a total of $ 644,000 and Ponting alone $ 265,000 for the appeal. Asia XI, with just one six, raised 282,000. Required to score 345 at nearly seven runs an over, Asia XI were off to a good start with Virender Sehwag and Sanath Jayasuriya going all guns balzing. But neither lasted long as Sehwag scored a 39-ball 45 with five fours and one six before he fell into the trap laid by Warne and Jayasuriya (28 off 29) was dismissed by Kiwi all rounder Chris Cairns who had earlier smacked a 47-ball 69. Reduced to 76 for two, it was left to Ganguly and Dravid to carry out the rescue act but with the pitch offering some turn and the spinners bowling a tight line, the asking rate kept mounting. Ganguly (22) succumbed to pressure and so did Yousuf Youhana (4) and Abdul Razzaq (11). Dravid tried to delay the inevitable in the company of Kumara Sangakkara, who had a good day behind the stumps, but the run chase proved an uphill task with wickets falling at regular intervals. Daniel Vettori emerged as the most successful bowler claiming three for 58 while Warne, coming out of one-day retirement to play the match, picked two for 27 off seven overs. Earlier, Ponting’s men played to the gallery and entertained the sell-out crowd with some breathtaking display of aggressive batting. That the match was being watched ‘live’ by a huge television audience across 122 countries only added to the spectacle. Off to a poor start after Ponting won the toss in the presence of Australian Prime Minister John Howard, the Rest were propped up by the sterling 102-ball 115 by Ponting besides a whirlwind 47-ball 69 by Cairns and a fine half century by West Indies skipper Brian Lara.A cameo by Vettori, who slammed 27 off 17 balls, capped the magnificent effort by the world’s cricketing elite. There was hardly a dull moment with stars like Tendulkar and Muralitharan shrugging off injuries to take part in the match. Murali, who has been sidelined with a shoulder injury, got as much ovation as the popular Warne — and it would surely have helped the champion off-spinner forget the humiliation of 1995 when he was no-balled seven times at this very venue. Fall of wickets- 1-1, 2-50, 3-172, 4-263, 5-264, 6-286, 7-292, 8-337-8. Bowling: Vaas 9-1-59-1, Zaheer 8-0-46-2, Razzaq 5-0-50-0, Muralitharan 10-0-59-3, Kumble 10-0-73-2, Sehwag 7-0-46-0, Jayasuriya 1-0-8-0. Fall of wickets: 1-59, 2-76, 3-107, 4-114, 5-156, 6-173, 7-197, 8-199, 9-226. India's highest Test wicket-taker Anil Kumble considers himself lucky as tsunami hit a Chennai seaside village on December 26, barely 10 minutes after he and his family had left the cottage there. Kumble, who is here to take part in the tsunami charity match, revealed to the Sydney Morning Herald that it was probably a creek that saved the cottage. 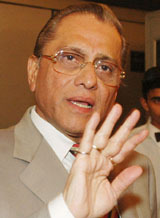 Though Mr Jagmohan Dalmiya has to abdicate his position as the "Patron-in-Chief", the former president of the Board of Control for Cricket in India (BCCI) felt vindicated at the Supreme Court ruling, upholding the BCCI elections held on September 29, 2004 in Kolkata, which proved that the "judiciary (in the country) was vibrant". (Mr Ranbir Singh Mahendra, a former secretary of the BCCI, was elected president, pipping Union Minister Sharad Pawar by the casting vote of Mr Dalmiya, which was contested by the Netaji Club of Chennai). At a hurriedly summoned press conference after the Supreme Court order, Mr Dalmiya said he was "feeling happy that the Supreme Court has upheld my casting vote and the conduct of the elections." He said a meeting of the BCCI would be called soon to complete the incomplete agenda of the BCCI as well as to formalise the election of president-elect Ranbir Singh Mahendra). The Court ruling has also removed any uncertainty regarding the forthcoming return tour of Pakistan to India (from February to April). The court ruling would also help Dalmiya wriggle out of the "uncomfortable position" in which he was in during the past 100 days. He said he had never aspired for the post of the "Patron-in Chief" as he had seen and enjoyed enough of cricket power in his 20-year innings as a cricket official. Mr Dalmiya said from being the treasurer of the Cricket Association of Bengal to becoming the president of the International Cricket Council (ICC), he had traversed enough distance to enjoy cricket power, and become whatever he is today in sports administration. "Cricket has given me plenty", he said, with a touch of nostalgia. Mr Dalmiya said he never sought the post of "Patron-in-Chief" nor did he "manoeuvre" to get it. "I tried to be neutral when I was being elected," he added. Mr Dalmiya said he had met Union Minister for Youth Affairs and Sports Sunil Dutt regarding the hosting of the second tsunami charity match in India, which is likely to be held in Kolkata. Mr Dalmiya, who is the president of the Asian Cricket Council, said the ICC had informed the BCCI that the match would be sanctioned only at a venue where total tax exemption would be granted. The dream came true for Bangladesh when left-arm spinner Haque had last Zimbabwean batsman Christopher Mpofu caught by Mohammad Ashraful at silly-point in the afternoon session to trigger wild celebrations on and off the field. Zimbabwe, playing their first match after their Test programme was suspended in June for fielding weak sides following a row between their cricket board and regular white players, were shot out for 154 chasing an improbable 381-run victory target. The Bangladeshi cricketers hugged each other and danced, with skipper Habibul Bashar leading his team-mates on a victory lap in front of delirious fans. Bangladesh had waited more than four years and 34 Tests for this memorable moment, having lost 31 of their previous matches since gaining Test status in 2000. The remaining three games -- two against Zimbabwe and one against the West Indies -- were drawn. Bangladesh's unlikely hero was 18-year-old Haque who finished with 6-45, the best by a Bangladeshi bowler in Test cricket. 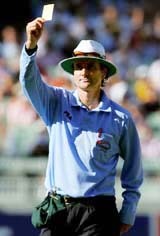 He troubled all the Zimbabwean batsmen on a wearing fifth-day pitch with his turn and shrewd variations. Middle-order batsman Hamilton Mazakadza, who played his last Test in November 2002, alone offered some resistance to the Bangladeshi attack as he slammed a solid 56 for his second half-century in eight matches. But his team-mates failed to cope with Haque, who had ensured Bangladesh's historic victory with three big wickets in the morning session. Zimbabwe, needing a minimum of 90 overs to save the match, floundered in the first session when they lost Brendan Taylor (44), skipper Tatenda Taibu (nought) and Masakadza after resuming at 46-3. Man-of-the-Match Haque struck the first blow when he removed Taylor, who was trapped leg-before offering no stroke to a delivery that spun in. He hit six fours in his 73-ball knock. Fall of wickets: 1-2, 2-2, 3-42, 4-112, 5-115, 6-126, 7-138, 8-143, 9-145. Prime Minister Khaleda Zia was among those to send congratulations to the team, coaches and cricket board officials, the offical news agency BSS said. “We are ecstatic. It is a victory for the whole nation,” Momohsin Uddin Chowdhury, manager of a television showroom in Chittagong, told AFP. A crowd of more than 100 people gathered outside the showroom to watch the match through the window, he said. “People were glued to the screens. Then they won and everyone got extremely excited, cheering and jumping around with joy,” he said. The Prime Minister paid tribute to all those who had contributed to the victory and urged the team to strive to improve its performance further, BSS added. Chittagong school pupil Tasosin Alam, 16, broke off from studying for exams to watch the Tigers claim their long-awaited triumph. Mr Suresh Chandel, MP, will be the Chief Guest on the occasion. It will be a do-or-die battle for Haryana who have already lost their first match to Punjab at Una by just one wicket. Medium pacer Joginder Sharma, who did well for India in one-day matches against Bangladesh, will spearhead their bowling attack. In yesterday's match at Una match, he took 2 wickets for 48 runs. In batting, Haryana, will depend upon Chetan Sharma, Bhageshwar, Sunny Singh, captain Ajay Ratra and Joginder Sharma. The hosts will mainly depend upon their medium pacers Vikramjit Malik, Ashok Thakur, Sangram Singh and spinners Vishal Bhatia and Saurabh Rattan to contain their rivals. All these bowlers had performed well in the first match and had compelled the services to wind up their inning at 164. However, there were many lapses on part of Himachal bowlers as they conceded 50 extras. For batting, Himachal Pradesh will depend upon Sandeep Sharma, Sangram Singh and Manvinder Bisla. Rahul Panta and Paras Dogra will be to support the frontline batsmen. Both teams had net practice in the Amtar ground today and enjoyed the surroundings of river Beas flowing nearby. Himachal Pradesh : Sandeep Sharma, Rahul Panta, Sangram Singh, Paras Dogra, Manvinder Bisla, Ajay Manu, Virendra Sharma, Vishal Bhatia, Saurabh Rattan, Ashok Thakur and Vikramjit Malik. Haryana: Chetan Sharma, Bhageswar, Sunny Singh, Shafiq Khan, Ajay Ratra, Joginder Sharma, Mahesh Rawat, Sachin Rana, Amit Mishra, Gaurab Vasistha and Jitendra Malik. Match will start at 9 am. Two current Indian captains — Amir Singh in the senior section and Sube Singh in the junior section — are from HSIDC. The HSIDC are the club champions of India. Top clubs of India, including ONGC, Kochi Refineries, Southern Railway, South-Central Railway, Indian Overseas Bank and Indian Navy took part in this tournament. In the final, HSIDC dethroned South-Central Railway by 25-18, 25-22, 27-25, 28-26, 15-10. Earlier, they had beaten IOB (Chennai) 25-18, 25-15, 25-21, Indian Navy 25-21, 25-21, 25-17, Southern Railway 25-19, 25-21, 25-23 and Kochi Refineries 27-25, 25-17, 32-30, 25-18. HSIDC remained unbeaten throughout. The HSIDC volleyball team claimed top honours in the 52nd All-India Tayaji Memorial Tournament from December 30 to January 2, 2005. They defeated BSF in the final to emerge champions. Giving details of the achievements, Mr Randhir Singh, Executive Director, HSIDC, said three corporation players — Amir Singh, Sanjay Kumar and Dinesh Kumar Singh — were members of the Indian team which won the gold in the SAF Games in Islamabad in April last year. Om Prakash, was the coach of the Indian team. Sanjay Kumar, Dinesh Kumar, Darshan Singh, Ram Pal Singh and Sube Singh, all of HSIDC, were members of the Indian team which played against Kazakhstan in Test matches. Sanjay, Dinesh, Darshan and Ram Pal Singh were selected in the Indian team which competed in the Asian Junior Men’s Volleyball Championship which was held at Doha in September last year. Indian doubles star, Mahesh Bhupathi proved that he is yet to settle down with a partner just like Leander Paes as he frittered away chances with Jonas Bjorkman (Swedan) to bow down to unseeded Rainer Schuettler (Germany) and Yen Hsun Lu (Taipei) 5-7, 6-4, 6-7 (4) in a marathon doubles final, which lasted about three hours, in the ATP Tour Chennai Open here late last night. Bhupathi, who was looking for his fifth title here, and Bjorkman serving for the match (6-5) wilted under pressure to surrender the initiative messing up a championship point, thereby helping the rivals grab the opportunity to take the match into the tie-break for winning the title. He had won the title for three years in a row from 1997 and later in 2002 with Paes, who playing with new partner Nenad Jimonjic lost in the semi-finals on Saturday. As the match started, Lu and Schuettler continued with their gameplan of total attack and relied on pace like in their previous matches in the tournament. Lu and Schuettler, particularly the former, ruled the roost overpowering Bhupathi for points. Bhupathi was exposed as the rivals had more percentage of success playing up front and finding gaps on a number of occasions in the whole match. Lu and his partner kept troubling the top seeds throughout. They also served well for winning their games. On the other hand, Bhupathi and Bjorkman, who between them share nine grand slam titles, gambled with hustling tactics but only to be disappointed. Constant positive approach of Lu and Schuettler helped them to win the match as they fetched good returns right from the time they broke Bjorkman in the sixth game before taking a 5-2 lead. Winning titles is becoming a habit with Irina Brar. She added another feather in her cap last week by clinching the Southern India Open Ladies Golf Championship in Bangalore. Her aggregate over four rounds was 292 (75-71-75-71). She set a course record of 71 in the second round and did it again in the fourth. This is the fourth title that Irina has bagged in the past year or so. The earlier three were the Punjab Open, the Western India Open and the Northern India Open. She finished runner-up in the Madras Open and the Eastern India Open. Her ability to adapt to different types of conditions has held her in good stead. Brushing aside her injury problems, the 21-year-old Irina is in peak form at present. Back home after her victory in Bangalore, Irina hoped to end the season with a bang by winning the All-India Ladies Open which begins in Kolkata on January 17. It has been a great comeback for the BA final year student, who has been dogged by injuries for quite some time. After the tournament in Kolkata, Irina will devote the next few months to undergoing physiotherapy. A busy season is ahead of her in the summer, with tournaments lined up in Malaysia, Hong Kong and Sri Lanka as part of the Asian Tour. Becoming a professional is not her top priority at the moment. She admits that the professional scene in India is not encouraging for lady golfers. She will take a crack at giving up her amateur status when she travels to the USA to major in sports psychology. Irina is grateful to Indian Oil, her employer, for backing her through thick and thin. She is also full of praise for her alma mater, MCM DAV College, who have been granting her leave liberally to concentrate on her game. Sukhbir Singh Gill, Brojen Singh, Anurag Raghuvanshi and Iqbal Singh have been chosen to lead the other four teams in the event — Chandigarh Dynamos, Imphal Rangers, Delhi Dazzlers and Bengal Tigers respectively, a media statement said here today. Lucknow Nawabs: Rajneesh Mishra (capt), Sushil Rai, Neeraj Kujur (both GK), Haseen Hussain, Aftab Ahmed, Santosh Kushwah, Amit Kumar, Surin Shul Joha, Muhammed Kalim, Vinay Ghete, Imtiyaz Ahmed, Amarjeet Singh, Amit Tyagi, Arshad, Praveen Singh, Amjad Khan, Avinash Saxena and Kamlesh. Coach: Satish Sharma; Asst coach: Mohd Raza. Rajpal Singh, Harbhajan Singh, Nawdep Singh, Baldev Singh, Gaurav Tokhi, Jugraj Singh, Ravi Pal Singh, Sardar Singh and Baljet Singh Chand. Coach: N S Sodhi; Asst coach: Kiran Kumar. Imphal Rangers: Brojen Singh (capt), Ksh Herojit Singh, Robindro Singh, H Tomba Singh, Sh Benarjit Singh, L Laimba Singh, R K Tomba Singh, N Ingocha Singh, Ghorong Horo, Kh Sumesh Kanta Singh, R Atul Ansari, Gopal Singh, M Chittaranjan Singh, R Adeba Singh, K Hera Singh, L Joychandra Singh and Shanta Kumar. Coach: Thoiba Singh. Delhi Dazzlers: Anurag Raghivanshi (capt), Jasbir Singh, Shailendra Kumar (both goalkepers), Gaganpreet, Manjinder Sodhi, Avtar Singh, Rupinder Singh, Yoginder Gulia, Anwar Khan, Sandeep Sethi, Amit, Navbhir Singh, Sukhpat Singh, Bikas Toppo, Raju, Gurcharan Singh, Prem Kumar and Ajit Pal Singh. Chief coach: Rajinder Singh; Coach: Romesh Pathania.